Motorcycling as a hobby has really taken off over the last few years with just about every motorcycle manufacturer enjoying great sales numbers. You’ve probably also noticed that they’re now more expensive than ever which is sadly providing an opportunity for less honest members of our society (I’m trying to keep it polite) to relieve us of our hard earned and much loved possessions. Well, it doesn’t have to be that way as there are many forms of motorcycle theft protection. Here we give you the rundown of the best motorcycle disc locks available on the market today and help you decided which one is right for you depending on your requirements. Welcome to our best motorcycle disc lock round up and review. 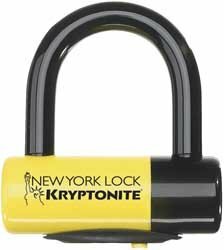 Kryptonite have done it again, this time with their miniature New York disc lock. This type of lock attaches to your brake disc through one of the large gaps in metal that most discs commonly feature. The shackle is a hefty 14mm so it is as strong as those you would normally see paired with a larger security chain and features a double deadbolt to prevent it from being pulled apart. We found the locking mechanism to be really smooth on this one so you shouldn’t have to spent too much time trying to get it on and off your bike and the lock has a dust cover for added protection. It also comes with a neon orange ‘reminder cord’ which you wrap around your handlebars or clip-ons so you don’t end up trying to ride off with the lock still attached! 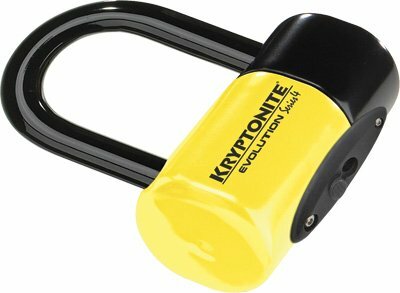 Weighing in at 2.25 lbs (1.02 kg) and achieving a Sold Secured Gold rating as well as being the highest rated disc lock that Kryptonite sells means that the New York should be at the top of your list – and to top it all off, Kryptonite’s Anti-Theft Protection Offer is applicable if some undesirable does manage to remove it. The Evolution Series 4 is slightly smaller and lighter than its big brother but manages to provide almost as much protection against theft. It features a 14mm hardened steel shackle, designed to resist leverage and cutting attacks and the same anti-drill protection. It does forego the double deadbolt which is why it hasn’t scored as highly as the New York. Sadly, you also go without the orange reminder cord which can be bought separately. The weight comes in at 1.85 lbs (0.84 kg) which is nice and light and this lock will fit under most motorcycle seats. An ART rating of 4/5 has been achieved but the Anti-Theft Protection Offer on this one comes in a little lower in the event of theft. For us, unless you must have your motorcycle accessories in matching colours (black, red and orange are available), we would stick with the New York. The design of the Sledg 77 is unusual with Abus deciding on a cartridge type housing instead of the usual hoop or pin design. Which isn’t to say that it isn’t up to the job as the heavy duty 13mm steel bolt has been recessed into the body of this lock in such a way that makes it very difficult to get a pair bolt cutters anywhere near it. The housing itself is thick and is formed with hardened steel and then wrapped in a soft plastic cover to prevent accidental damage to your wheels or brakes. The KryptoLok 10-S is your standard pin hole disc lock which attaches itself to your brake disc by feeding the locking bolt through one of the many holes drilled into the disc. The bolt then engages into the mechanism on the other side of the lock where it cannot be removed until unlocked with one of the supplied keys. A nifty design because the small diameter of the disc brake holes would make it impossible to insert a cutting tool through in an attempt to snip the bolt. 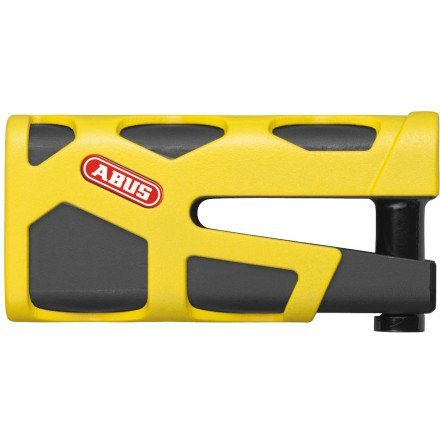 The bolt is sized at 10mm and the housing is drop forged steel which resists cutting, sawing, freezing and chisel attacks. Due to its design, gaining leverage with bolt cutters and being able to make an effective cut into the lock would also be very difficult. Couple this with its light weight of 2.00 lbs (0.91 kg) and we see no reason why you would not carry this with you whenever you intend to leave your motorcycle unattended. 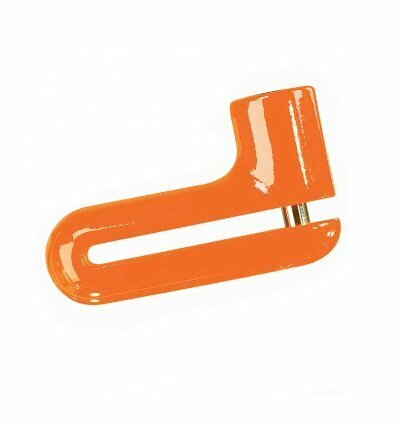 An orange reminder cord is standard and the lock itself comes in three different colours, polished chrome, yellow and orange. Kryptonite’s Anti-Theft Protection Offer is provided. The final disc lock on test is Kryptonite’s entry level KryptoLok Series 2. Very similar in design to the Series 4 but smaller still, this lock features a 13mm steel shackle, a rotating instead of sliding dust cover and doesn’t come with a reminder cord. From a security point of view the Series 2 is adequate for use in low risk areas but the lack of features puts it at the bottom of our list. It is also the lightest here on test at 1.35 lbs (0.61 kg). 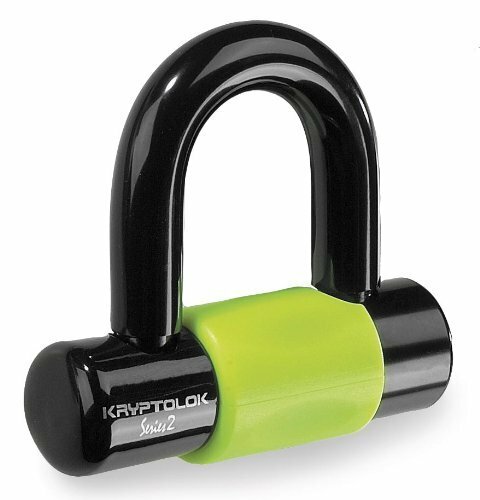 There is no official security rating applicable but Kryptonite have provided their Anti-Theft Protection Offer at the same value as their 10-S lock. And there is our review and conclusion on the best motorcycle disc locks available on the market today. We also have a section on the best motorcycle disc lock alarms which you can find here. As always, feel free to send us a message with your experiences.